Be warned… this is one of those mornings when I just don’t really feel like doing a blog post. It isn’t necessarily that I don’t want to write… it is that I don’t feel like I have anything really exciting to share with the world. But several months ago I made a commitment to blog every morning or evening, and I have not dropped that promise yet. Though quite honestly the timing of the evening posts has been a bit odd and something I need to work on. Most of yesterday was spent in some fashion roaming around town. At first I was on a mission to hit a bunch of used bookstores, namely the largest ones here in town looking for something I could not quite describe. Essentially I am doing a lot of pre-writing for my attempt on NaNoWriMo this year. I am one of those people that I don’t feel like I can write about something, without knowing more about the world itself. The world I have built in my head is extremely intricate and as a result I am having to do quite a bit of research. The only problem is I cannot put my finger on exactly what I am looking for. I have been searching for ethnic folk tales, lore, and even role-playing game books that are set in non-European/American settings. I feel like in those two realms I have a fairly firm grasp on the classical lore, mythology and cast of creatures. Where I am really lacking is China and the countries of the former USSR. Additionally I could definitely use some more information on the creatures of the African continent. I know some of it, but not nearly the clarity I would like. Essentially I am trying to build political struggles, kingdoms and relationships between various groups of magical creatures. I have a lot of things in place, but I want more resolution and granularity of who lives where and controls what. The irony about this whole thing is… that the story I will likely weave through this world will only touch a tiny tiny bit of it. But I feel like I need to know what the topography of the world is like before i can populate any part of it with characters. This is also why I am getting started this far ahead of November, trying to weave together a world that makes sense to me. One of the things I hate about a novel is when it feels like there was no master plan to the world, or that when a big reveal happens. it is a massive let down because it doesn’t make much sense. Since this is a hang-up of mine… I feel like I have to build the world first and then write about it. I thought that maybe I might stumble onto a collected book of folklore or something like that, but at the end of the day I pretty much came up empty. I got one very thin children’s book that collected some non-traditional mythology… that will mostly be a point of reference as I look up all of the tales it mentions online. The one overarching thing about Final Fantasy is that at no point can you really take yourself too seriously. For a good chunk of yesterday when I was not out and about searching for whatever I was looking for… I ran around looking like this. This is one of the few times I wished I was colorblind… this was all bought off the same vendor mind you. 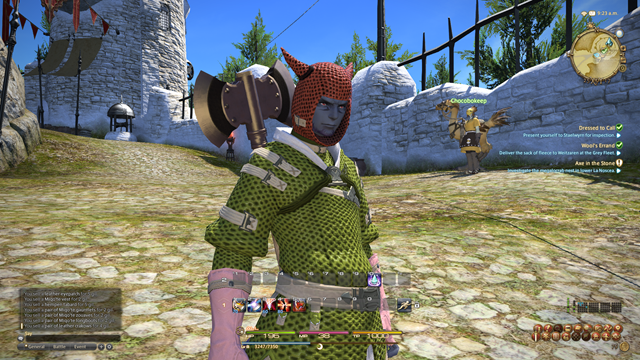 Not sure how a red horned helm, green hauberk, pink gloves and white/yellow pants go together… but man is it colorful. That is the thing that makes Final Fantasy so different that most of western games, is that it is over the top absurd at times… in the character designs, the bosses and monsters, and even the dialog. To some extent this makes the game play more enjoyable because you are unable to get completely focused in on the mission at hand. I find I have done a lot of “stopping to smell the roses” in this game so far as I haphazardly roam around the countryside looking for whatever I happen to need for a quest. There are a ton of intricate systems in this game, and most of them are not well explained to the player. I stumbled onto a hunting system that seems to involve you killing a certain number of mobs with a “cheese wheel” icon on their head. These are lumped into ranges and there is some kind of reward for completing a difficulty tier. Additionally I figured out that the “Golden Pretzel” Icon I kept seeing is actually anytime you are gaining experience. This is no lie… I seriously kept trying to figure out how I could spend all those pretzels I was gaining. Upon second look… I am guessing it is probably a golden cherry blossom or something of the sort. But to me it looks like a pretzel.. and the advance dialog icon still looks like an ice cream cone. I can tell this game as a whole was not designed for western eyes. Like I am sure not everyone sees a pretzel when they look at that icon, that for someone else it would make a lot more sense. One of the other cool things I stumbled onto was what I am calling Story Quests for lack of a proper term. Essentially every so often you will get a quest that involves you going to investigate something. When you do it will launch into a short cut scene, and then usually a pretty epic battle that is sometimes assisted by NPCs joining your fight. From what I understand these are unique to your class, so that the ones I am getting are for marauders alone. They remind me a lot of the SWTOR class storyline in that you have an opening cinematic/dialog the fight itself and then a resolution cinematic/dialog after it is over. Some of the battles like the one above are just absolutely insane. Essentially me and the party of NPCs had to deal with wave after wave of giant crabs, each wave including smaller mobs and big boss mobs. From what I can tell the secret seems to be.. focus on the smaller adds and let the NPCs deal with the big guys for you. Once they have solid aggro and you have finished off the trash waves, you can help them burn down the big guys. I’ve done three of these so far, and that seems to be the rule for each. How you can generally tell is if the boss type mob is a significant number of levels higher than the trash mobs. So far I am still enjoying myself playing the beta. I still feel like there is a ton that I just do not quite understand yet… but overall that has not prevented me from enjoying the game as a whole. This is one of those games that is deceptively simple at face value, but seems to have a ton of different and intricate systems once you get engaged with it. This should help to keep players hooked on the title for the long haul. 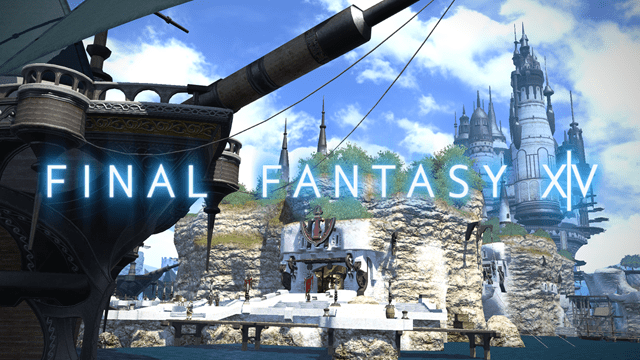 I did not experience the 1.0 version of Final Fantasy XIV but the 2.0 version seems like it is something that western audiences will really enjoy. I hope you all have a great weekend, as right now I am cutting this off and going to go play some more. Good morning you happy people, or at least I am trying to view the world as happy people. In the process of waking up, and I have just munched on a wonderful sausage roll. My wife is back safely from her trip, so honestly it is a pretty good day. Later on we are going to go out used bookstore shopping… essentially I am looking for reference material for my process leading up to a run on NaNoWriMo. I am doing a lot of pre-writing and world building to give myself a base to build a story upon. Nonetheless it should be a pretty leisurely welcome back to town activity, since we are both bibliophiles. 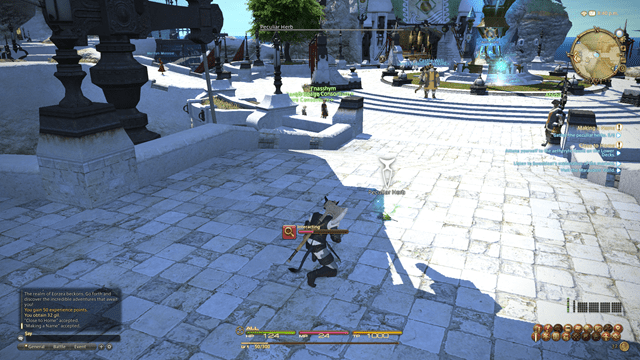 Last night I got the opportunity to play Final Fantasy XIV a Realm Reborn for the first time. I went into this process a little sceptical based on the horror stories I had heard about Final Fantasy XI and the original revision of this game. However Square Enix has spent lots of money and many years making the title over for this relaunch and it shows. I have an odd relationship with the Final Fantasy franchise. These are among some of my favorite games, but something happened along the way. After Final Fantasy IX it seems like they change the style of gameplay. They went from lots of open world exploration to mostly “on rails” action sequences blended between a ton of cut scenes. I have never been a huge fan of the whole “interactive movie” experience… I want to play a game… not watch it. So as a result I have fallen fairly out of love with Final Fantasy and the vast majority of JRPGs. However recently I have been replaying my favorite games in the series… namely Final Fantasy 4,5 and 6. 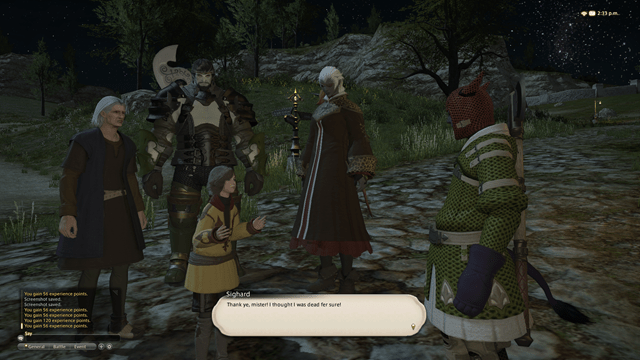 Final Fantasy XIV seems to be a call back to this noslagic area of the game, and I am completely fine with that. The setting is magical and steampunky at the same time… and there is an ever present evil empire component to the storyline as told through the opening vignet. I had flashbacks to the opening sequence of Final Fantasy 6 as I saw the same magitech walkers here. Additionally there are chocobo stables sprinked throughout the world and this really gives the overall feeling that you are back in the classic area of Final Fantasy. Character creation is an essential part of any game, in that can you create something you want to play. 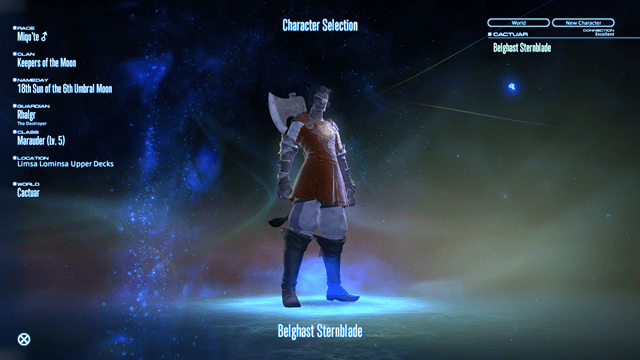 Normally I have this problem with asian mmos… for whatever reason I can never create a character I like the appearance of. I have never really gone in for the “pretty boy” appearance that they all seem to want to give you. 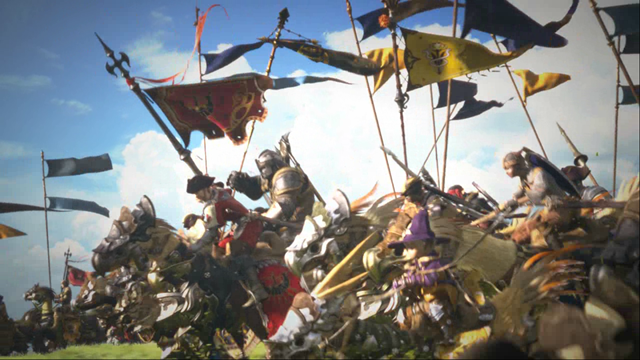 Final Fantasy however strikes a good blend between that standard and the rough and tumble western ideal. Essentially you can choose between playing humans, elves, gnome like Lalafel, big ogre-like race, and finally the mi’quote the cat people. Oddly enough after playing with the character creator a bit I found that I really liked the appearance of the Mi’quote so I ended up rolling a cat person. I am not really sure how to quantify it, but they feel far less like a “gag” race than this concept normally is. I felt like I could make a really interesting looking character that felt roguish and tough in spite of the fact that it has a tail. Essentially they are more “Thundercat” and less Popori from TERA, and since I have always dug the Thundercats… it works for me. The big improvement of this game and their character creation over most of the Asian MMOs is that they have facial hair. This probably is not a big deal to most of the population… but for me… all of my characters have facial hair. One of the biggest problems i have with Dragon’s Prophet for example, is that I had to choose between one of two looks… Handlebar Moustache or Unruly Man from the North. There should always be steps between, and all games should have a nice clean moustache and goatee combo. To developers out there… the fastest way for me to not like your game… is to not have a facial hair slider. I had done some research ahead of coming into the game, and at the suggestion of friends that know my play style tastes… they suggested that I play a Maurader. It is essentially a semi-defensive two handed wielding warrior. I only managed to get through level 8 last night but I had several things in my arsenal at that point: a standard strike, a sunder armor type attack, a cool short term defensive buff that has an animation similar to “Shell”, a damage over time ability, and an ability that causes the next attack to heal me. Essentially all the trappings of the ideal high survival off-tank. I will be curious to see if they become more tanky over time, but I am pleased to know it really does fit my play style. 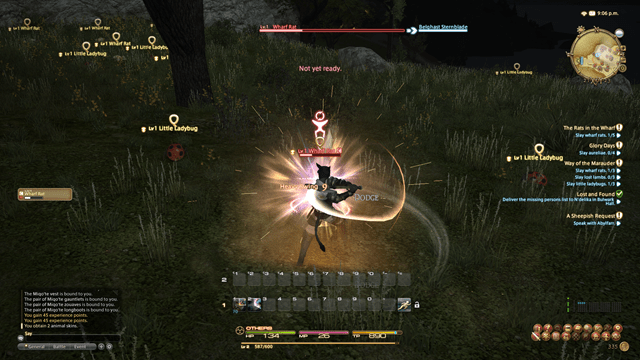 Combat itself is deceptively simple, in that you could mash buttons and kill mobs relatively effectively. However there seems to be some form of a built in combo system.. so that pressing one button will highlight the next attack in sequence. Doing the attacks in sequence ends up dealing a very significant amount more damage. Essentially the rotation I started doing was opening with my damage over time, refreshing my defensive ability if it was down, hitting my main strike and then hitting the sunder to complete a short combo. By then I at most would need another basic strike to finish the mob off. The other thing that feeds my bloodrage is the chain system. Essentially after killing two mobs in a row it starts a timer in the lower right hand corner of the screen. The game keeps track of every kill you make after the initial two, and at the end of the timer you are awarded bonus experience based on a multiple of the number of mobs you are able to kill in that timeframe. While I have not tested this out, I think this will mean that grouping and keeping up a chain will be a far more efficient way of leveling. This was admittedly the biggest barrier I had to the game at first. After slogging through a truly excessive amount of cutscene that is not skippable… and requires you to keep clicking the “ice cream cone” icon to progress the story… you are planted down in a port down and forced to run a ton of fed ex missions for the towns folk. The positive is that the dialog is extremely well written and often times laugh out loud funny. The negative is that there appears to be NO voice over at all.. and as a result the game feels extremely quiet. It is funny how we have gotten used to some measure of voice dialog feedback. Some of the quests are actually interesting… like there is one where you have to try and cheer up a pirate captain… and it walks you through the usage of common emotes. So you have to /rally at one point to bolster her spirits. Additionally it is nice that all quest items seem to be instanced, in that everyone gets their own copy of whatever clickable item needs to be clicked for a certain quest. Again however, if your tolerance of fed ex style chores is minimal you will struggle with this phase of the game. However it does reward a ton of money for doing it. What I found out after the fact from my friends is that you can essentially just leave town and immediately start doing combat quests. This is probably something I would opt for in the future… because after all the slogging through cut scenes… the last thing I really wanted to be doing was more cut scenes as I accepted all the townsfolk quests. Supposedly if you go out and start the combat quests, you catch up in level extremely quickly and there is really no need to ever do the work for the townsfolk other than to get money or as a way of touring the town. This is hands down the best part about the game… the world is completely gorgeous. Everything about it just screams careful art direction. The buildings are huge, the countryside rolling and open… this feels every bit the part of a modern Final Fantasy game where everything is pretty and filled with activity. Additionally it runs amazingly well on my laptop. All of these shots were taken last night as I played and I was getting roughly 60 frames per second the entire time. In certain ways the world reminds me of older MMOs, in that there are lots of little dungeons appearing all over the place… without actually declaring themselves dungeons. There are so many things that exist just to exist and I have not found quests associated with them. The game definitely seems to lay things out in a way as to encouraging exploring your way across the countryside. Additionally I like that there are “revenge mobs” in the middle of leveling areas that you need to avoid. In an area with level 2 and 3 mobs for example, there are giant roaming level 13 grass ogres that you have to be aware of. Granted at this level they are non-aggro but I am sure that will not be the case eventually. I have to admit I have great nostalgia for the fear that the Sand Giants in Oasis of Marr induced in players… and I look forward to seeing this progress as I move through content. 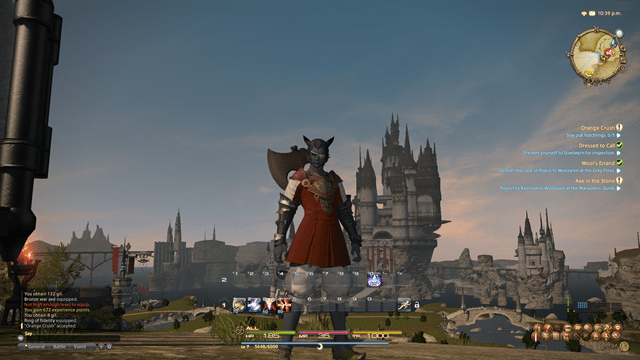 Final Fantasy XIV feels like World of Warcraft got lucky with Final Fantasy XII… and this offspring was the result. Final Fantasy XII always felt like a single player MMO to me… and this game takes that concept, adds addditional people, fleshes it out and borrows a ton of polish from World of Warcraft. It has better written and more creative quests, but there is no real innovation in that department. If you hate WoW questing you will likely struggle here as well. It has extremely simple and satisfying combat, but again no real innovation. If you struggled with traditional MMO combat, you will also struggle here. The real selling point of the game is that it proves an extremely polished final fantasy MMO experience. Everything about this world screams final fantasy, from the opening sequence, to the way everyone dresses, to the UI feedback sounds and orchestral fill… all proudly say this is a final fantasy game. If you always wished you could play a Final Fantasy game that was like World of Warcraft… bam you have your ideal title right here. I found it extremely enjoyable and pretty much as soon as I finish writing this review I will be booting back up the game and continuing my journey. This game is proof that you don’t always have to innovate to make something enjoyable.